Thanks to online banking services, you can now keep track of your incomings and outgoings, with just a few clicks of a button. This will help you keep an eye on you’re spending and should prevent you from going into your overdraft unintentionally. It will also make sure that all payments and direct debits go out on time and will allow you to transfer money directly into someone else’s account. Applying for a credit card offer used to mean standing in the bank for hours on end – but this is no longer the case. Now, you can apply for a credit card online via your PC, laptop or handheld device and can get the best offers and deals available. Want to get your finances in order and consolidate your debts? Then look for a balance transfer credit card and make the most of low interest rates. With the new Premiership League season now underway, why not apply for a football credit card via the web? You’ll benefit from introductory rates, exclusive discounts and football goodies and will earn reward points whenever you spend. What’s more, reputable providers will also make contributions to your club whenever you use your card – at no extra cost to you. There are also rugby, charity and travel credit cards available, so it’s worth doing your homework online. One of the best things about the internet is that it allows you to compare credit cards from various suppliers, quickly and efficiently. While some providers have made it easier than ever to compare credit cards across their whole range, others will look at the whole market – and will give you a valuable insight into the banking world. Did you know that some credit card providers offer exclusive discount for web users? That’s right, many companies put deals online – such as 0 per cent on balance transfers for a certain number of months – so it’s up to you to find them. Type a key word or company name into a search engine and you should find what you want, when you want it – without wasting time. The internet has changed the way we shop, the way we communicate and the way we interact, so make the most of this useful platform. I would be the same way with finances exclusively online, but they need me to go into the bank to deposit foreign currency checks. So once a month I walk over to the bank, but since I work from home I can fit in whenever. I do use the internet to compare available credit cards though. I couldn’t imagine not using the internet for something like that. We also use the web a ton for our finances. When I was searching for the best credit card offers that’s exactly where I turned. We ended up going with the Chase Sapphire and Chase Freedom cards. The offer on the Sapphire card right now is just ridiculous. I’ve earned $470 cash-back in less than 1.5 months. Personally I’m anti-Chase because their affiliate program is so poorly managed. It does sound like they’ve got some pretty sweet offers right now though. I banked the $400 sign up bonus buying my air conditioner. I got the card just for that! Will cancel when the annual fee kicks in! I do everything online anymore. I can’t even remember the last time that I actually looked at a paper bank statement. I agree with your statement on comparing. Most websites no matter if it’s credit cards or anything else give you the ability to compare products. This really helps consumers make a must more informed decision. I sure don’t miss getting the paper bills for things like my bank account. Sure it makes me slack off and not check it as much as I should, but it’s nice to save that time and the paper. We end up benefiting a lot from the ability to compare financial products. Not only can we easily see which is the best deal, but companies become more competitive as they try to offer the more attractive product. I use the web to check my statements and input to my tracking programs that are not internet based. Checking statements online is pretty convenient, especially when you need to dig back through old statements such as at tax time. I remember having to pay to get statements printed in the past when I didn’t happen to have some. I use the web to compare and contrast, but I still like to go in and talk to a person when possible. In terms of bank and trading, I do most of it online and some banking in-person. These days there is just so little banking that needs to be done in person. If it weren’t for my foreign currency income, I probably would never go into the bank. I do like how they offer me lower rates and other deals when I do go in to talk to them though. I do almost everything online these days. I was resistant to it at first- but it really is so convenient and easy. I LOVE online banking! Online banking sure does simplify things. We don’t even have to remember how much we have in the bank. We can just quick check our balance and make any changes instantly. It must cut a lot of costs for banks too. I’ve always been a fan of actually going into your local bank. It’s always nice that the manager knows who you are in case you need something or there’s a problem. They can fix things that would take you days to do via email or hours on the phone. Also, you can work them to get better deals. I’ve had a CD rate bumped up 50 basis points by asking. Granted I still compare most things from the comfort of my couch, but I’m more apt to go in than most it seems. I guess you’re just old school 🙂 They are much more willing to give you better deals when you go in and talk to them in person. It’s not like your online banking is just going to suddenly offer you a lower interest rate. This reminds me: I have got a new debit card like 2 months ago and I can’t find my pin # for it, but who cares? I make all purchases with my credit card and do all other banking online. Heck, I can even deposit my checks (if people still write those) online with my scanner at home. The only thing I need my debit pin number is cash withdrawals. Beyond that, I pretty much never make any debit purchases. Back in college debit was my go to payment method and my bank fees reflected that. The Internet has made tracking your finances incredibly easy. I use online banking, pay all my bills online, and even have an online only account. I couldn’t imagine standing around at a bank to sign up for a credit card. Do people still do that? Signing up for a credit card in your bank seems like such a strange thing to even consider these days. Ok I actually applied for one that way, but only because they offered to waive my checking fees in return. I have set auto payment for all recurring bills. That’s a huge help. Just 15 years ago, it would have been crazy to even think about automating your monthly bill payments. Ahh good old auto-payment. It’s so nice to not have to worry about bills at all. The companies must love getting paid on time so much too. I’m all for any way we can simplify our lives. It’s kind of funny that these days I wonder how I could even get by without online banking. It’s so useful to keep track of finances, pay bills, and research products that the idea of doing it the old way face to face seems painfully archaic. I guess the only downside is that it truly shows the previous era where you would know your banker and get financial help or a loan based on trust or your relationship is over. Now you are just numbers they put in a machine and it cranks back a YES or NO for any sort of approval. I guess there’s pros and cons of such a system. Personally since my credit history is quite strong, I have no problem with a machine determining my eligibility for loans or better rates. It might be tough for someone who is overcoming previous problems though. A computer won’t care about their sob story. I’m just waiting for the day when we don’t actually use money anymore. I love online bill pay, banking, and investing. I can’t remember when I had to use a stamp. It would be strange to not use money at all, although I’m pretty close to that. It would just put extra strain of the small businesses that rely on cash…places like hot dog stands, small markets, child entrepreneurs, etc. It seems there will always be a need for cash. The government would love a cashless system though. Then they could track everyone’s exact spending and income. Wait, MBNA still exists? Most of my credit problems started when my MBNA credit card and loan became Bank of America credit card and loan. And then they rejected the repayment plan that I had in place. Maybe they only exist as a separate entity in the UK. I know with my MBNA card I got a notice about them being bought out by someone else. I guess it’s cheaper to still keep operating under the MBNA name though. Online banking has been my best friend for years. I remember the days of writing checks at my kitchen table for the bills I had to pay. Yikes! I can’t imagine going back to that! Eww, I hate writing checks. I still can’t believe that I have to pay my rent by check in this day and age. I wonder why the property rental business is so far behind the times. While there is a lot of bad advice online when it comes to personal finance, there is also a lot of great resources that are offered online. 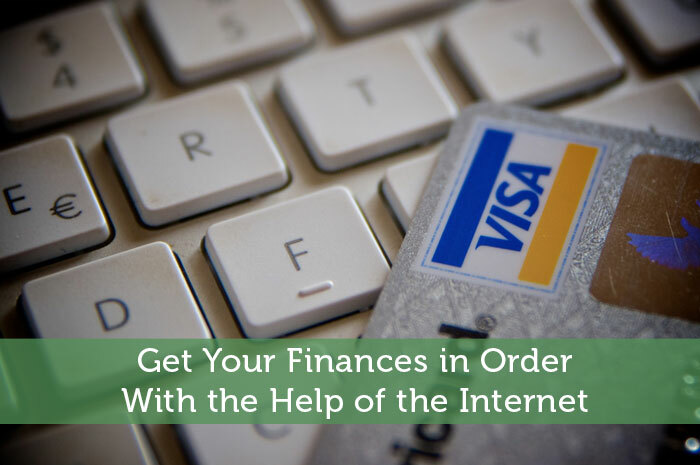 From being able to compare products and services online and with many free tracking tools, there is some value to using the internet to help get your finances in order. It’s definitely a lot easier to manage your finances now compared to 10-15 years ago. I couldn’t imagine having to manage my finances without all of the tools I use online.